Length of Her Spine," oil, 36"x24"
In my experience, healing is a whole lot more than attending to the physical body. It is the development of an integrated functioning of mind, body and spirit. It is the creation of a state of physiology where the light of the higher Self can flow unrestricted to all parts of the human experience – mental, physical, emotional, energetic. When we are disconnected from our higher Self we not only lose touch with our spiritual essence, we also set the stage for physical and emotional suffering. How do we reconnect with the Self? How do we remember our life’s purpose? How do we bring bliss back into our daily experience? There are probably as many ways of reconnecting with our source as there are souls on the planet. Many turn to religion, others to meditation, others devote themselves to service to others. As an artist, I find that opening yourself to the flow of creativity is a perfect way to reconnect to the divine Self. The process of painting (or writing, or sculpting, etc.) is in itself a process of healing. To me the most amazing miracle of existence is the creation of the individual soul. Somehow, out of that divine, omnipresent hugeness we call God, an endless supply of tiny sparks of divinity bubble up. These sparks of divinity that we call souls, grow into great beings of light and incarnate into different nervous systems to play in this wonderful creation. Some of these beings (over seven billion at this time) have taken on human nervous systems to enjoy life on our planet Earth. But Mother Earth is in a very dense part of multidimensional creation. In this dense human nervous system, most of us have a very limited range of experience. We forget that our essence, our higher Self, is that spark of divinity, that individualized particle of God. Fortunately, that divine spark – our inner essence – is always trying to remind us of our origin, and give us clues on the best way to live our lives. By allowing the mind to settle down, we can listen to the messages that are being delivered. But for many this seems like an impossible task. This is where the creative process comes into play. When we allow the paintbrush to flow, or “put pen to paper”, we are giving the higher Self an opportunity to express itself. It is in the refinement of the creative process that healing takes place. “Does this brush stroke really express what my heart wants to say? Not quite. Okay, let’s make some adjustment. Yes – now it captures the right mood or meaning.” In this refinement, our physiology – mental, emotional, and physical – is transformed. It becomes a more perfect conduit for the divine Light that is trying to push through our nervous system. Sometimes this impulse comes from within. Sometimes it comes from the environment. 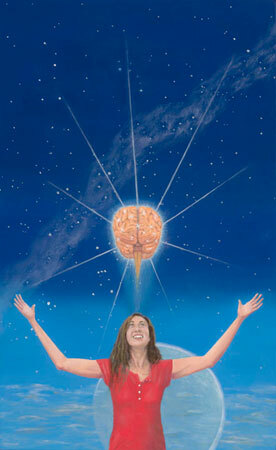 When you paint an inner experience of consciousness you are remembering the spark of divinity that you are. When you paint a landscape, you are attuning your nervous system to an expression of the Divine. The Divine is present everywhere. Look for it. Look for ways to express it. With every act of creativity you will be transforming your nervous system to be a more perfect vessel of divine Light – a perfect instrument for the flow of God’s love. A few days ago I attended an art show featuring recent work by my friend Lydia Hesse. 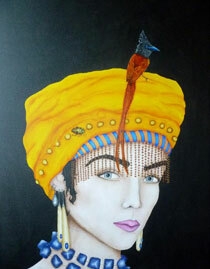 Lydia paints the most delightful creations of amazing people with exotic birds perched on their heads. At least that's what I thought they were at first. As I was drawn from one painting to another, I realized something else was going on. 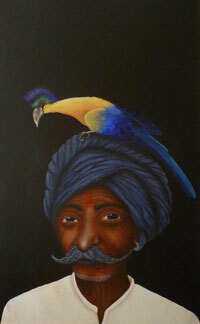 Each painting was named after the bird. The birds were primary – the people were secondary. So I asked Lydia how she would describe her work. She responded, "They are paintings of birds with people under them." Wow! This opened up a completely new way of looking at the world – a new way of understanding the relationship between people and the environment. The paintings are magical because of the unique point-of-view Lydia had when she conceived her paintings. This got me thinking about the relationship between perspective and point-of-view. Art teachers will tell you that point-of-view refers to your eye-level when viewing a painting. Once you know the eye-level, you can figure out the perspective – determine the horizon, the vanishing point, and the relationships of height and distance. All of these elements create the sense of a three-dimensional space on a two-dimensional canvas. Now I think about this in a completely different way. The point-of-view is a way of looking at the world, an aspect of the artist's consciousness that he or she wants to impart to the viewer. In Lydia's point-of-view, the birds and animals have spirit people rather than people having spirit animals. An artist's point-of-view may be their love of how light dances on an object. It could be the expression of a multidimensional presence. Or maybe it's pointing out a subtle value of a gross physical object. Perspective or point-of-view – which takes precedence? To me, point-of-view is the clear winner. Perspective is secondary. It's just a tool to help the artist express point-of-view. Perspective should be the servant, not the master. In some cases perfect perspective is the best way to get the point-of-view across to the viewer. But sometimes it's not. 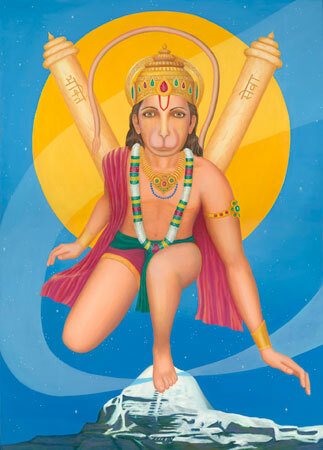 "Hanuman," oil, 72" x 60"
A distortion of perspective can often be a major distraction to the real message of the painting. But in other situations, skewing the perspective might enhance the point-of-view. I have a friend in Vancouver whose aunt was an artist. Her perspectives were always very bizzare. I commented on this to my friend and he responded, "Oh, she does that on purpose. She's trying to make people look at things differently." Point-of-view was very important to her, even though some art critics shuddered. 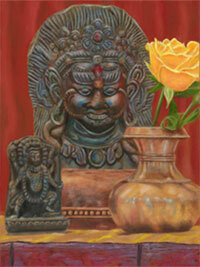 When I did my large painting of Hanuman, I wanted him to be bigger than life. I wanted him to be jumping out of the canvas. I used a slight distortion of perspective to make this happen. His foot rests on Mount Kailash. But since his foot is so large in relation to the mountain, it makes him appear to be even more in the foreground. The mountain appears to recede. His forward arm is a bit longer than it would normally be according to the rules of perspective. All to support the point-of-view. And it seems to work. People stand in front of the painting and say, "He seems to be jumping right out at me." First figure out your point-of-view. Then use perspective (or lack of it) to fulfill your vision. ﻿When I first took up painting a few years ago, it didn't take long to realize that it was much more than creating a beautiful picture. Like other forms of creativity, painting is a technology of consciousness, both for the artist and for the viewer. As any artist or musician knows, the creative process works best when the ego steps aside and allows the higher Self to take control. And any time you do this, it leads to the growth of higher consciousness. The great spiritual teacher Maharishi Mahesh Yogi once said that real art is painting the Devas, and everything else is just painting one's stress. The Devas are commonly understood to be the Vedic Gods. But Maharishi used a broader meaning. He described the Devas as those values of intelligence which govern the various laws of nature. So I don’t think he just meant painting the Vedic Gods, but painting the devata value, or divine inner intelligence, of any person, object, or scene. A fellow artist in Santa Fe, Wendy Higgins, creates the most beautiful still life paintings. What makes them so wonderful is that she is able to capture the Divine Intelligence in the object. The flowers, the fruit, the vases – each object radiates Light. When you look at her paintings you don't just see the flower or the pot, you see Beauty. Wendy says, "For me there's a universal quality to the beauty I see. And if I can open someone's eyes to that beauty, consciously or not, that opens their heart. I am, in a sense, worshipping the beauty I see and falling deeper and deeper in love with that which I feel is an expression of our source." The essential nature of each of us is infinite, divine Wholeness. When the ego steps aside, that inner divine Light is able to make an appearance. When the painter allows his or her awareness to favor the Wholeness, then every brush stroke brings a taste of Wholeness to the canvas. The inner Silence, the divine Presence, which is usually hidden from view, is displayed for everyone to see. "Face East & Pray to Your Ancestors 1," pastel, 15"x22"
Anastasia Hurlin is able to do this in her incredible figurative paintings. She says, "In my own work I strive for wholeness. 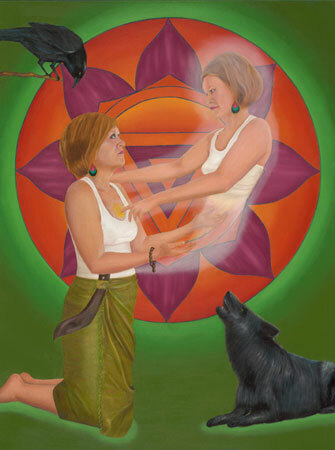 I mirror the empowered woman through my art, bringing out her inherent beauty and integrity. I acknowledge our common power, our passion, our shakti. I find my true center in the presence of divinely engaged women. Immersed in this 'texture', I paint." 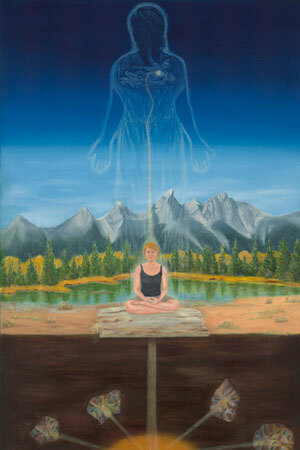 When someone stands in front of such a painting, the divine Wholeness is "stirred" in that person. 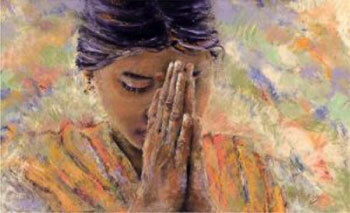 The painting helps that person to recognize, even for a moment, his or her own divine nature. For the artist that favors Wholeness, the act of painting becomes a technology of transformation. It's like meditation, where repeated exposure to inner Silence cultures the nervous system to be able to support that Silence even during activity. Painting so that Wholeness moves through the brush onto the canvas alters the nervous system and makes one capable of sustaining a heightened awareness throughout the day. It transforms the nervous system to support more Wholeness. Painting in this way changes the way you see the world. Painting from the level of Wholeness allows you to recognize Wholeness in others and in your environment. Even people or objects that previously seemed distasteful are now seen as windows to the Divine. It is said that what you put your attention on grows stronger. While painting your stress can be cathartic, I shudder to think of the effect it has on the viewer, and on the painter’s life. When you put your attention on the inner divine Wholeness as you paint, then divine Light becomes stronger in every aspect of your life. The Divine is present everywhere. Bring that Presence into your paintings, and your appreciation of everyone and everything will flourish.